Tis the season, very soon, for holiday cards and newsletters - the kind of mail we like to get. And then there's the junk mail - which you can eliminate (or drastically reduce) by following these junk mail reduction suggestions. But here are two tales of people who didn't get their junk mail because of actions taken by their mailmen. "Mailman Steve," as he's known to the children on his route, got 3 years probation yesterday for failing to deliver years worth of junk mail that was found stacked in his garage and buried in his backyard. Some consider "Mailman Steve" an anti-junk mail superhero — but it seems that Mr. Padgett was just overwhelmed. Padgett's efforts to spare the neighbors their junk mail were not much appreciated by the Direct Marketing Assn. The 3,400-member group considers such mail a boon for consumers seeking discounts and services and for small businesses seeking to target customers. Eight of 10 people actually look at such mail, and a "large percentage" take advantage of coupons and discounts, said Sandy Cutts, the association's public affairs director. And please don't call it "junk mail," Cutts said. "We don't use the 'J' word." 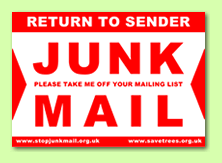 When most people receive junk mail it goes straight in the bin. But when postal worker Jamie Coult saw it piling up at Harpings Road sorting office in west Hull he decided to steal it and sell it on eBay. The former postman stole the junk mail which included money off vouchers for Lurpak, Pampers, McCain chips and Wetherspoons. What Kind of Junk Mail Recipient are You? Junk mail - Yuck! I called a number that was recommended for getting off junk mail lists. They asked for my social security number. That ended with me declining. We have a duplex and still get junk mail for tenants who haven't lived here for 15 years. Lee, the number you call to stop getting credit card offers does indeed ask for your social security number. (See the FTC web site which talks about this.) However, you can opt out on-line without providing your social security number. But the other junk mail elimination web sites, phone numbers, etc. should not ask for your social security number. You may want to look at the resources I listed and try again. There's also some good advice here. I've seen some advice about dealing with mail for previous tenants here and here.